ItemC-08758 - Mamie Fell and companions. ItemC-08760 - Catherine O'Keefe and others. ItemC-08761 - Lawrence O'Keefe and an unidentified woman. ItemC-08763 - "Harrison Hot Springs Hotel and Mount Cheam, BC, Canada." ItemC-08765 - "435,000 lbs halibut; one day's arrival at Prince Rupert." ItemC-08775 - Sydney Charles Burton. ItemC-08777 - Arthur M. Tyrrell. ItemC-08781 - Arthur E. Meighen. ItemC-08771 - Kamloops City Council. 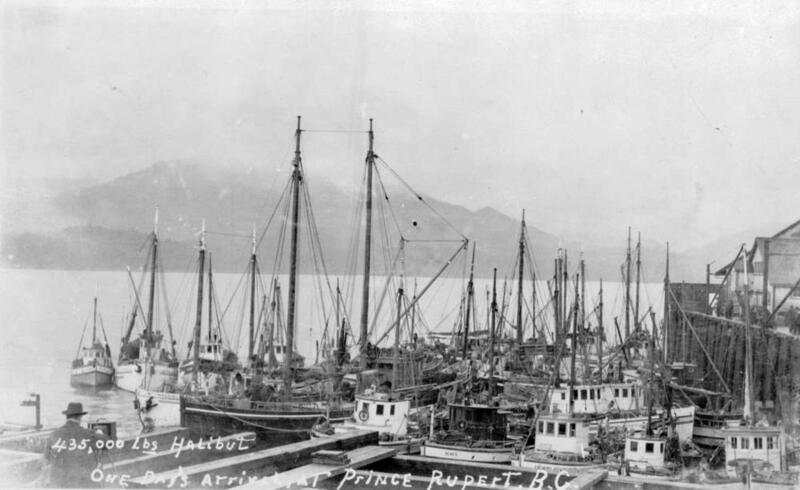 Item C-08765 - "435,000 lbs halibut; one day's arrival at Prince Rupert." "435,000 lbs halibut; one day's arrival at Prince Rupert." Attributions and conjectures: The photographer is undetermined.